This beautifully presented, three bedroom detached property is situated on a spacious corner plot in a peaceful residential neighbourhood of Tala. The property is maintained to a high standard with spacious accommodation and quality finishes throughout. The ground floor features an open plan living room with comfortable lounge and formal dining area. A corner, fully fitted kitchen is nicely separated from the living space by a granite topped breakfast bar and with light from both side windows and rear facing patio doors, the living area has plenty of natural light. A guest WC, utility area and under-stairs storage space is situated adjacent to a central, elegant marble staircase leading to the first floor hallway and accommodation. Here there are three double bedrooms, all of which are nice and bright with contemporary style, white fitted wardrobes. The master benefits from a modern en-suite bathroom and together with bedroom two, has access directly to a covered veranda with fabulous coastal and mountain views. A separate, family size shower room is situated directly off the hallway. Moving to the outdoor leisure space, an 8m x 4m kidney shaped swimming pool with sunbathing terrace provides a focal point in the fully enclosed garden featuring palm trees, plus many varieties of beautiful shrubs and bushes. A pool pump house with additional storage space is nicely tucked away in one corner of the garden and a gated driveway is situated at the entrance of the property. 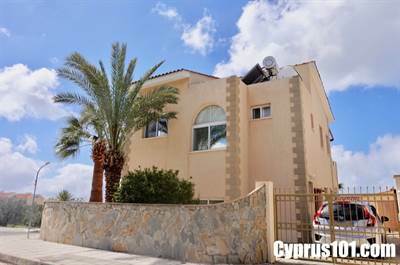 The property is highly suitable for those searching for a well finished, quality permanent residence or holiday home in an established residential neighbourhood. Furniture can be included if required and title deeds are available.